John is a tour guide and accomplished angler whoknows the area thoroughly, and on the odd occasion you could be lucky enough to enjoy a seafood braai. 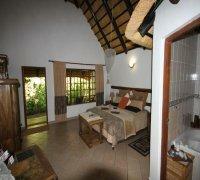 His thatched home and tropical garden exudes African ambience. There’s lots of thoughtful extras like decent filter coffee, fresh flowers and chocolate. Owner designed and managed, African Ambience Guest House is located in St Lucia on the Elephant Coast in KwaZulu Natal and is a home away from home. 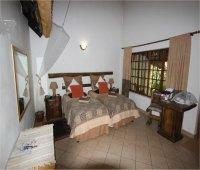 Set in tropical gardens with tranquil koi ponds, pool and water features, adjacent to the nature reserve. Well-appointed bedrooms in an ethnic African style, some with king-size beds and patios, offer many comforts for a memorable stay, including Honeymoon room with spa bath. 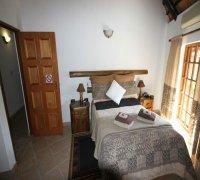 Generous breakfasts of your choice and occasional seafood and fish braai evenings. Beaches and restaurants nearby. Seasonal whale and turtle watching. Resident tour guide. "We had two absolutely relaxing and wonderful days in the house and at the pool. Laura helped us to find the best places and the best restaurant! Thanks very much for the great breakfast you created very morning for us!! Hope to come back!! All the best"
From the N2 highway take the Mtubatuba turn-off marked R618 and follow the signs to St. Lucia (approximately 28 km). Once over the bridge, turn right at the T-Junction into McKenzie Street (the main road in St. Lucia), continue past the Spar Supermarket on your left, past the thatched fruit and craft market on your right and at the next traffic circle, turn left into Albacore Road and left at the second street. 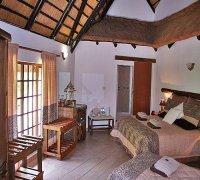 African Ambience is the first house on the left (thatched roof) No 124 Pelican Street.